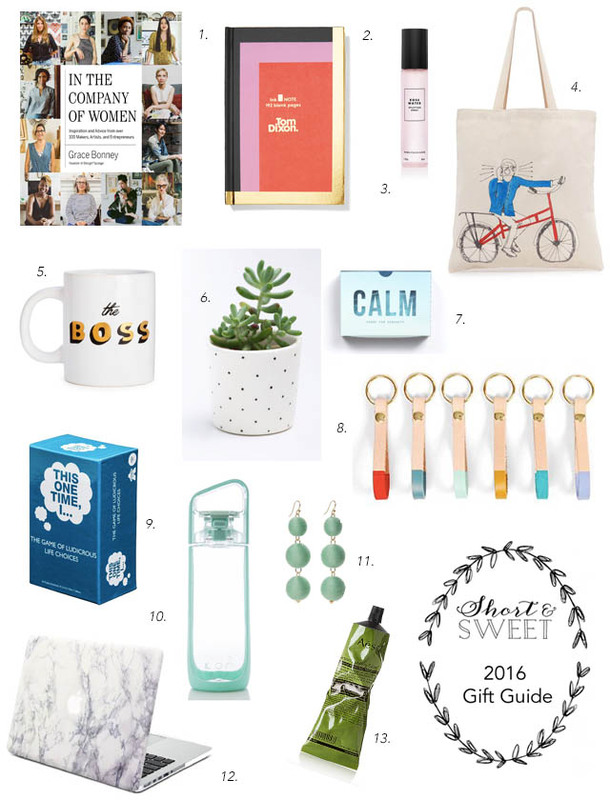 Since it's back to work for most of us after a long Thanksgiving weekend (wah wah) I thought I'd share a gift guide for your coworkers. My team does a Secret Santa so there are items on here that would make a good gift for a group exchange, but I also have gifts for your work wife (or husband). Top row: 1. I've had the pleasure of meeting Grace Bonney for a workshop she did here in San Francisco, and cannot wait to pick up her book, In the Company of Women. Sure to inspire your cubicle mate, the book profiles and celebrates 100+ influential and creative women spanning a variety of ages, races, backgrounds and industries. // 2. Make her meetings more chic with the Tom Dixon Ink Color-Block Hardback Notebook. // 3. I love gifting coworkers something they can keep in their work bag or by their desk to brighten their day. Beautycounter Rose Water Uplifting Spray is one of those things. // 4. For a fashion-obsessed coworker, you can't go wrong with this Bill Cunninham Tote Bag. Bottom Rows: 9. If your workplace is into funny or quirky gifts, I love the idea of gifting This One Time I … The Game of Ludicrous Life Choices. Just beware of playing this with all coworkers as it is hilarious but often explicit! // 10. For someone you don't know that well (or someone you really know well, and know they need this) I like the idea of gifting a sleek water bottle like this KOR Delta BPA Free Water Bottle. Bonus: it comes in a bunch of colors and is easy to clean. // 11. I have been seeing these earrings everywhere: Three Tier Pom Bon Earrings. // 12. If you want to go the office supply route, you can't do better than this Marble Macbook Air Hard Case. // 13. Aesop is one of my favorite brands because it's the perfect intersection of beautiful branding and quality product. A coworker has the Aesop Geranium Leaf Body Balm and I love the scent.